a fun place to ride! Rutland County Pony Club was established in January of 2010 with an active and growing group of Pony Club members plus a Horsemasters group of adults. Both groups collaborate to host several shows, clinics, and events, as well as 1-2 mounted meetings per month year round. Several qualified instructors donate their time helping members from beginners to advanced. We fundraise to support members competing at regional and national Pony Club Competitions. We meet at several barns with indoor arenas, and enjoy 2 cross country jump courses, where our riders school and host competitions. Most of our members compete in dressage, eventing, and hunter/jumper shows. We hope to add some other activities Pony Club offers, like Tetrathlon, Games and Polo Crosse. We are open to Pony Clubbers age 5-25; our Housemasters group is open to adults of any age. If you would like to learn more about either of our groups, contact Andrea Hathaway-Miglorie at 802-345-9257. 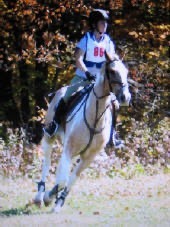 Pony Clubber Steph Wissel riding Target.